Pectoralis minor is the smaller sibling of the larger and more talked about pectoralis (pec) major. But for such a small, seemingly insignificant muscle, it can sure cause some problems. The pec minor is found underneath its larger partner, originating from ribs 3, 4 and 5 and passing superiorly and laterally to attach to the coracoid process of the scapula. Its functions are to stabilize the scapula, as well as depressing, protracting and downwardly rotating it. When the scapula is fixed, pec minor will also assist in elevating the ribcage. OK, so we know where it is and what it does. But why is it often so troublesome? Pec minor is a major player when it comes to good (or bad) posture. One role of the pec minor is protraction of the scapula. Protraction is the forward movement of the scapula, away from the spine and around the ribcage — allowing the shoulders to become rounded forward. It is unfortunate that life for many of us consists of a lot of sitting down. We sit at desks, computers, in cars, etc., and usually slumped over whatever we are working on, shoulders rounded, back arched and head down. Habitually holding this position, in which pec minor is shortened for extended periods, often results in a facilitated, overactive, tight (or whatever adjective you want to use) pec minor. An overactive pec minor can have a significant effect on the function of the shoulder joint, which in turn can lead to injuries. Probably the most common injury to occur as a direct result of a short pec minor is subacromial impingement. 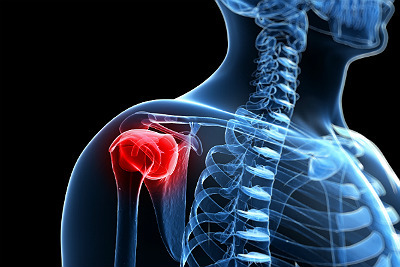 In this condition, a lack of space below the subacromial arch causes the underlying tendons (typically supraspinatus, and also the subacromial bursa) to be impinged or "pinched" with arm movements above shoulder height and especially with a rotation element. This lack of space below the subacromial arch can be directly linked to an overactive pec minor protracting, anteriorly tilting and downwardly rotating the scapula, effectively lowering the subacromial arch. Along with the increased impingement risk, a tight pec minor and subsequently inhibited serratus anterior causes the glenoid fossa to become more vertical in its alignment, resulting in increased abduction, rotation and winging of the scapula. This altered position requires the levator scapulae and upper fibers of trapezius to increase activation in an attempt to maintain glenohumeral stability. The end result in this scenario is the tight neck and shoulders with active trigger points, as suffered by so many desk workers when these muscles work overtime. As if this isn't enough, pec minor is also responsible for up to 50 percent of cases of thoracic outlet syndrome (TOS), which are subsequently termed pec minor syndrome. TOS is due to a compression of the nerves and blood vessels found in the chest and anterior shoulder (the brachial plexus and subclavian artery and vein). The condition is similar to that of sciatica in the lower limb, where the symptoms can vary significantly depending on the site and extent of compression. In the case of pec minor syndrome, the nerves and blood vessels which run between the muscle and the rib cage can become compressed due to excessive muscular tension. As you can see, the pec minor can cause significant problems for the shoulder joint, neck and upper limb in particular. I could go on to talk about the effect that pec minor can have on the lower back and pelvis as a result of compensations occurring throughout the kinetic chain, but we'll save that for another day. It's all very well knowing that a tight pec minor can be the cue for numerous injuries, but we also need to know how to recognize one when we see it. There are a few ways that a short pec minor may be identified, or at least hypothesized. First, have a look at the patient's posture, paying particular attention to the position of the humeral head and scapula. If the pec minor is tight, it is usual to see some level of winging of the scapula, coupled with protraction and you may notice an internal rotation of the humeral head, too. Second, ask the patient to lie in a supine position with the arms rested by their sides. Place a small folded towel under the upper arm to eliminate any shoulder extension which could affect the test result. Palpate the posterior aspect of the acromion process on the top of the shoulder and measure its height off the treatment couch. A height of one inch or more suggests a tight pec minor. This test is especially useful in unilateral injuries where the height can be compared between sides. However, other muscles may also influence the position of the acromion (such as biceps brachii and coracobrachialis) and so it is best not to use this test in isolation. Third, palpate the muscle itself. A tight muscle will usually feel tight and will also feel tender to the patient. This is a very subjective form of assessment and should only be used to confirm findings from previous assessments, as well as potentially demonstrating the problem to the patient. The good news is that pec minor responds pretty well to treatment. Manual therapies such as massage and trigger pointing are a great place to start and can make a noticeable difference in a relatively short space of time. They should be used in conjunction with partner (passive) stretching during clinic time and stretches as part of a home exercise program. It can be tricky to effectively stretch the pec minor on your own, especially without placing undue force on the anterior capsule of the shoulder joint. There are a few ways that can be used, but probably the most popular — and the one I tend to use — requires the patient to lie lengthways along a cylindrical object such as a foam roller (or half roller). In this position, the shoulders are allowed to drop back toward the floor as the patient relaxes, feeling a subtle stretch in the front of the shoulder and into the upper chest. The arm position can also be altered, from by the sides, to approximately 80, 120 and 160 degrees of abduction to stretch the muscle in more functional positions. In addition to stretching, a home exercise plan should also aim to strengthen those muscles that counteract the pull from pec minor. Focus on the mid and lower fibers of trapezius, serratus anterior, posterior deltoid and infraspinatus to help retract and upwardly rotate the scapula and externally rotate the humerus.